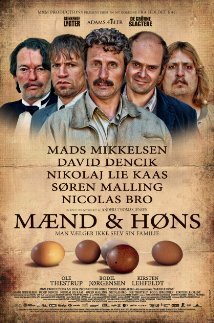 In this hilarious and outrageously twisted comedy, multiple award winner, Anders Thomas Jensen, transforms Mads Mikkelsen (Hannibal, Casino Royale) into “Elias,” one of the least appealing humans ever to shine on the silver screen. When their father dies, Elias and his brother, Gabriel (David Dencik, The Girl With The Dragon Tattoo), discover that they are adopted. During the search for their real parents, they stumble upon three more brothers. Who live on an island in an abandoned, decaying sanatorium and have a penchant for unexpected blunt-force head trauma. Plus, there’s something about the chickens who wander the off-limits basement that’s more than a little foreboding.